The Martian surface is a dry, barren wilderness whose surface area is similar to the landmass of Earth. Scientists have long disputed any notion that water, and life, might exist upon the Red Planet - since the days of the Viking landers, anyway. But for the last 15 years, the 'life on Mars' chill has gradually thawed in academic circles as anomalous evidence has emerged of water in Martian rocks, and even dry river beds spotted by orbital reconnaissance (1). 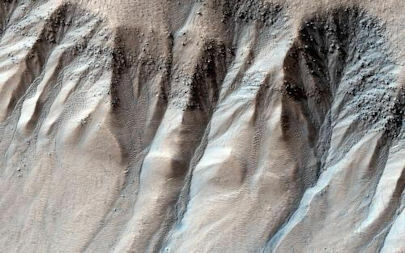 These gullies, which are sinuous channels found on steep slopes in mid and high latitudes, are mostly located at higher altitudes where the Martian atmosphere is thinner. This will make them tricky to visit by future landers, as there is less atmosphere to support a soft parachute landing onto potentially steep slopes. 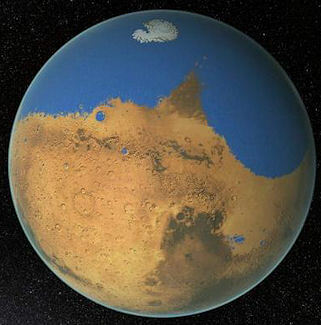 "Climate change caused by the variations in the tilt of Mars' poles may be the reason for the periodic water flows. Over time, as the pole changes tilt, sunlight hits different areas of the planet, causing the ice to migrate from the poles to more "temperate" latitudes. 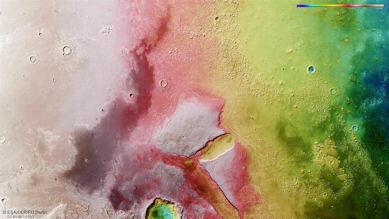 Right now, Mars is in a position where liquid water is unlikely to flow at gully locations. Climate models in concert with the gully observations predict, however, that water would have flowed as recently as 500,000 years ago. Fate of gullies on Mars ranges from complete removal to burial. Gullies at low latitudes are eroded and removed; gullies at high-latitude are buried. Inverted gullies are found between 40° and 50°S, between eroded and buried gullies. Inverted gullies require a minimum paleo-thickness of the latitude dependent mantle of ~30 m.
Ice, particularly CO2 permafrost, plays an important role in the composition of surface materials in the areas where these gullies are more common. Some of the movement of dry surface material in-filling the gullies may result from the periodic sublimation of frozen CO2, destabilising rocks/dirt/pebbles making up the ground surface around these features. But that movement of dry materials is insufficient to explain gullies that exhibit 'sinuosity values' in excess of what what is measured for dry channels on Earth (7). This extreme shift in the position of the Martian poles could have massive climate effects on the planet as the cycle progresses. Ice caps of water and CO2 would be warmed as they shift towards the equator. The ices would then sublimate into vapour. The CO2 component thus released into the atmosphere as the planet tilts onto its side not only adds to the thickness of the Martian atmosphere, but also provides a global warming greenhouse effect, providing a virtuous circle or atmospheric thickening and warming. The water released into the atmosphere increases humidity, and most likely accumulates as frost and ice onto the newly polarising zones. Hence, over time there would be the formation of new ice caps not seen today - caps which in term may destablise as the climate warms further and lead to rivers of melt water across the Martian landscape. Perhaps even the fleeting return of an ocean; the past existence of which has been suggested by spectrometer measurements of the distribution of various leached metals across the planet's surface (10). The very cyclical nature of this process insinuates that Mars may have undergone these changes many, many times over its lifetime. Indeed, we are observing the planet mid-cycle - a point which is, clearly, very dull indeed. 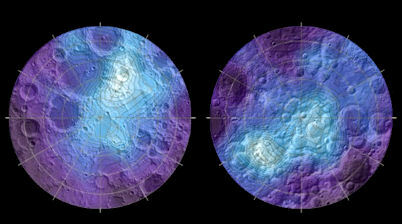 But it is not always like this, as Mars cycles through its various Ice Age changes and its climate varies accordingly. Recently, the discovery of pockets of methane on Mars has fuelled the speculation of extant life on the Red Planet (11). Could it be that life remains somewhat dormant under the Martian surface, awaiting the planet's eventual return to high obliquity and the release of liquid water across the planet's surface? Waiting for the long Martian winter to come to an end? Why, dear reader, have I described all of this in such detail on a blog essentially discussing the potential existence of a Dark Star in our solar system? Firstly, I believe that the extreme nature of Mars' cycles hints at the influence of a perturbing body in the planet's distant past. Secondly, I think that the figure mooted at the top of this article, namely 500,000 years ago, is a conservative estimate. The gullies look much fresher than that, as Malin and Edgett proposed 15 years ago (1). Also, the obliquity cycle is only 124,000 years long; so the planet's two extreme positions presumably occur a mere 62,000 years apart. If we're mid-way through the obliquity range at the moment, then the last extreme occurred about 30,000 years ago. Even if the most recent 'extreme' is mild compared to the kind of high-end obliquity variation Mars is sometimes capable of (12), there may still have been a significant shift in the planet's climate reflective of that end-point in the cycle. My point is that the way Mars looks now is not necessarily how it has always looked - not by any stretch of the imagination. Zecharia Sitchin discussed ancient accounts of Mars being the stomping round of Anunnaki colonists. They would struggle living there now, for sure (the latest flights of fancy of non-returning astronauts to this currently bleak world fill me with dread for all concerned), but there were fleeting times when the planet appears to have had a much thicker atmosphere, and running water. At those points in the chaotic Martian obliquity cycle, the planet would have been a much better candidate for colonisation. "The topographical view (Image 4, right) clearly shows the difference in altitude between the southern highlands (left in the image) and the northern lowlands (right). In the centre of the image there are two large mesas around 500 metres high and some 20 kilometres long, making them six times as large as the famous 1000-metre-high Table Mountain near Cape Town in South Africa. The two mountains once formed a contiguous massif but are now separated by an oval valley. The surface of the mesas differs greatly from their surroundings, indicating that the uppermost layer covering the mountains consists of a different material. In addition, on the southern side of the left-hand mesa, there is a small outflow channel. "“We now know Mars was wet for a much longer time than we thought before,” said [Michael] Mumma, [a senior scientist at NASA's Goddard Space Flight Center in Maryland]. Nasa’s Curiosity rover has already shown that Mars had standing water for 1.5 billion years, longer than it took for life to emerge on Earth. “Now we see that Mars must have been wet for a period even longer,” Mumma added. On a less uninhabitable Mars, the Anunnaki would have been able to fully exploit whatever mineral resources that the Red Planet had to offer, knowing that at some point the planet would lose its short summer and return to the barren, airless dry season we witness there today. 1) Malin, M. C., and K. S. Edgett (2000), "Evidence for recent groundwater seepage and surface runoff on Mars", Science, 288, 2330–2335. 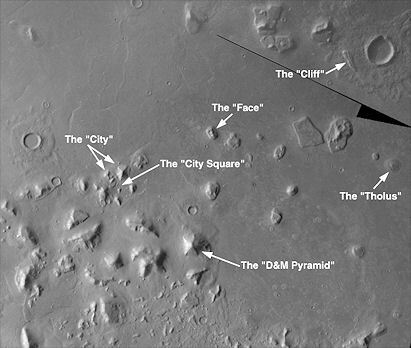 14) DLR News "The Cydonia Region – was the North of Mars Once Covered by an Ocean?" 12th March 2015 http://www.dlr.de/dlr/en/desktopdefault.aspx/tabid-10081/151_read-12991/#/gallery/18895 with thanks to Jim. DLR is the National Aeronautics and Space Research Centre of the Federal Republic of Germany. Since we're on the subject of tilted axes, and what they might tell us about a planet's past, it would appear that our very own Moon also has some tilt issues. A careful examination of the distribution of water ice at the lunar poles has shown that the Moon experienced a pole-shift at some point in its past. The reason the scientists initially missed this, of course, is that they didn't expect to see it. 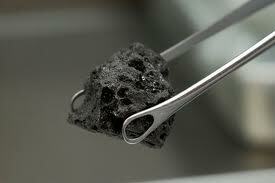 Just like NASA missed water on the Moon for decades, despite the evidence under their noses. India's ISRO Chandrayaan-1 lunar orbiter then detected water on the Moon in 2009, overturning the apple cart. Which leads us to the main problem here: If the off-centre ice formed early on, and the axis shift occurred, say, billions of years ago, then how have the off-centre deposits of ice survived, even if they're holed up in deep lunar craters on the lunar surface? As the Moon spins on its axis, these craters should be more readily exposed to the action of the Sun's glaring heat and the relentless solar wind than ice in polar craters. It's perfectly possible that the early Moon had abundant supplies of water (3). The Earth and Moon are intimately related, either forming as a double planet, or the Moon forming as a result of a massive collision between the early primordial Earth and a Mars-sized body. Over time, additional water ice could have been added to the Moon by comet impacts (4) - particularly during the late, heavy bombardment 3.9 billion years ago (5) - or by chemical action on the lunar surface (6). But, there should still have been an erosion of that water ice if exposed to the action of the Sun over time. There should be a cyclical process of deposition and then removal over time through sublimation into space. Which presumably implies that extant non-polar ice as either relatively recently deposited, or is hidden from the Sun's eroding glare. Either of these answers still begs the question - why this particular distribution of remnant non-polar ice? The high obliquity period hinted at by Oded Aharonson occurred when the Moon was about half the distance from Earth than it is now, during a period known as the Cassini State Transition (9). But it is thought that this period occurred some 3-4 billion years ago (9), which does not move us on too well given the current problem under debate. So how stable is the orientation of the Moon's axis more recently - say in a timeframe of millions rather than billions of years? If we're to understand why the non-polar ice is still hanging around following an pole-shift, then that timeframe is surely more relevant. If the Moon's obliquity is not really all that stable after all, then what events in its past caused the decline in its axial stability? Do these events point to a different origin for the Moon than the collision theory? If the Earth/Moon system is essentially a double planet, born together from the same material, then whatever happened to the Moon way back when to destabilise it could teach us a great deal about the early catastrophic history of our solar system. For those interested in Zecharia Sitchin's theories, the Moon (in the form of 'Kingu') was already orbiting the early Earth (Tiamat) at the time of the Celestial Battle (9). Within that context, it seems quite likely to me that the long-term instability of the Moon's axial orientation resulted from the incident with Nibiru/Marduk, the Dark Star, 3.9 billion years ago. The Earth/Moon double system, with Earth heavily wounded, migrated inwards. The Moon clung on, but its long-term obliquity was destabilised as a result. There's another possibility, following a similar line of attack. Sitchin considered it likely that some of the returns of Nibiru resulted in catastrophic events on Earth. The Biblical Flood is an example, which he considered to have been a cataclysmic jolting of the Antarctic ice cap at the end of the last Ice Age. Perhaps the gravitational effect of Planet X which led to this event also disrupted the Moon's obliquity, leading to the shift in the position of its poles as a result? It was something of a pleasant surprise when the scientists working on the Cassini probe's voyage to the Saturn system presented images of water gushing out into space from one of its moons. We're not talking about the massive moon Titan, but rather one of its more diminutive siblings - Enceladus. 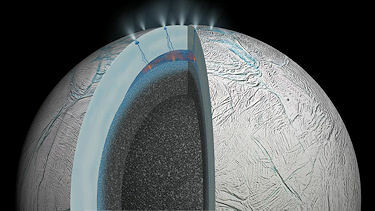 On the face of it, Enceladus is not a great candidate for liquid water. Saturn is, after all, a heck of a long way away from the Sun, and it's pretty cold out there. So, where Jupiter's Galilean moons still get a fair bit of sunshine, Enceladus is very much a poor cousin in this regard. 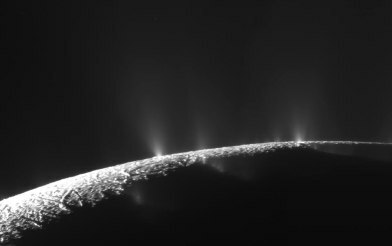 Yet, the same processes that warm the Galilean moons, making them potentially great candidates for life in warm sub-surface oceans, appear to also be at work on Enceladus. Additionally, that warm water is firing out of the small Saturnian moon, under a fair bit of pressure. Although the explanation hints at some independent, internal warming processes (both radioactive and chemical), the predominant effect at work here is the tidal heating. This is a central point to the Dark Star Theory. For a planet to be warm enough to sustain life out beyond Neptune (i.e. the fabled Nibiru/Planet X), then it requires partnership with a massive body nearby to provide the gravitational and magnetic fields sufficient to warm its interior. Enceladus shows just how incredibly strong this effect can be, given its distance from the Sun, and its orbit around a smaller gas giant than Jupiter, in this case the beautiful Saturn. So just imagine the potential for a warm home-world orbiting around a sub-brown dwarf several times the mass of Jupiter! We cover a lot of ground in the interview, exploring the many examples of indirect evidence for the Dark Star, and possible reasons why this has not been verified by direct imaging of the object in recent years. I put forward a new area of research interest about the nature of sub-brown dwarfs in wide orbits around their parent stars, and how they might be acting as 'cosmic vacuum cleaners' beyond the range of the parent star's magnetic field influence. I kind of wish I'd added the Kuiper Cliff controversy to this discussion, as it provides both another example of indirect evidence of the passage of an unseen object beyond the Kuiper Belt, and also possible corroborating evidence for this 'cosmic vacuum cleaner' effect. In other words, the Dark Star is sweeping out the region immediately beyond the Kuiper Belt during its perihelion passage, and wrapping itself up in the ensuing baggage - thus becoming ever more difficult to spot. Oh well... next time. Blood Red Planet Behind the Moon? This picture was taken on 10/08/14 during the blood moon, from Dover, PA by someone I went to high school with. 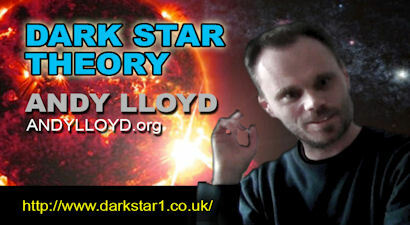 I’ve been learning about Planet X / Nibiru and came across your website http://www.andylloyd.org/darkstarblog23.htm, and then your blog. Since you are knowledgeable about this subject, and this picture is perplexing, I wondered if you might be able to identify what the red planet in the background is? I searched and found some other photos that showed Uranus as a small dot to the lower left of the moon that night, but this photo seems to capture a planet there that does not make sense. Just wanted to reach out to someone more familiar with the subject, as you seem to be, and thought you might like to see it. Thanks for sending this photo through. 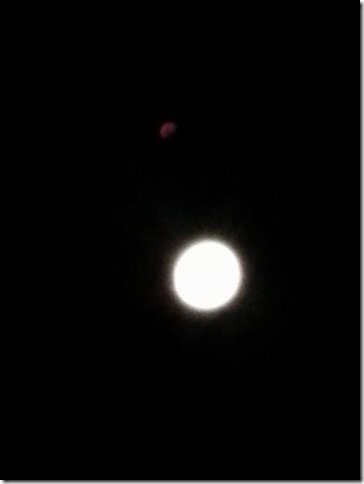 My gut feeling is that the red planet is a lens flare from the glare of the Moon. The Moon appears to be almost full (effectively in opposition to the Sun), but the 'planet' is partly occluded, giving the impression that it would be in a different position with respect to the Sun than indicated here. In other words, if it was indeed a planet then it, too, should be almost full, like the Moon, rather than being in 1/4 shadow. Did the person who took the photo actually see this red object at the time, or did it appear on the photo unexpectedly? She took the picture of the moon with her cell phone that night, not noticing the red planet image until later when she posted it, and at that point questioned why it was there. Thank you for explaining the lens flare / shadow effect, which makes sense. Sure is an odd image, nonetheless. Appreciate you taking a look at it, Andy! 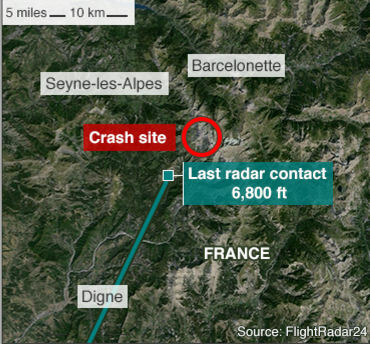 Another tragic, and mysterious, aircrash took place on Tuesday 24th March 2005 in the French Alps. Germanwings 4U 9525 flight en route from Barcelona to Dusseldorf descended unexpectedly, and apparently without discussion with air traffic control, over an approximately 10 minute period before striking the side of a snow-covered mountain in the Maritime Alps to the north of Nice (1). It has been suggested that there may have been a connection between this tragic event, which saw the loss of 150 lives, and the re-starting this week of the Large Hadron Collider (LHC) on the French-Swiss border somewhat to the north of this position (2,3). Is this plausible? To the right are some maps of the location, from FlightRadar24, which tracks air traffic around the world. 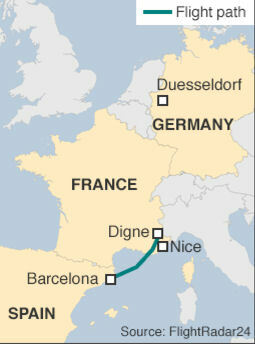 Looking at the trajectory of the plane - whilst considering the 10 minutes of unexpected descent before contact was lost with the aircraft - the drama preceding the crash presumably began somewhere over the Cote d'Azur and continued as the plane moved to the Northeast into the Alps. The LHC is quite a bit to the north of this position, up on the Franco-Swiss border near Geneva. If the LHC was responsible by somehow firing off a burst of high-energy particles in a random direction as it tried to carefully align the beams within its 17-mile underground circuit, then it would have been one freaky coincidence for a plane over a hundred miles away to have been hit by it! "The size of the LHC constitutes an exceptional engineering challenge with unique operational issues on account of the amount of energy stored in the magnets and the beams. While operating, the total energy stored in the magnets is 10 GJ (2,400 kilograms of TNT) and the total energy carried by the two beams reaches 724 MJ (173 kilograms of TNT). So, if not a direct threat through accidental release of an actual particle beam weapon across the French Alps, then could there have been some kind of 'Lost' like event through an bizarre, reality-bending experiment taking place? It doesn't look like a new experiment is due to take place until 30th March 2015, and even that may have been delayed (8). But even if an experiment had already taken place, surely planes in the Geneva area would have been similarly affected? As bizarre as the circumstances around this accident are, the LHC is innocent of all charges. I'm sure we'll find out more in the coming days and weeks *. * And indeed we did; the co-pilot is alleged to have been responsible for this disaster on the basis of data extracted from the recovered black-box flight-deck recorder, and other evidence gathered by investigators.